Summary: The description, specs, MSRP and photo for the Bond Arms Ranger II pistol, plus user ratings. 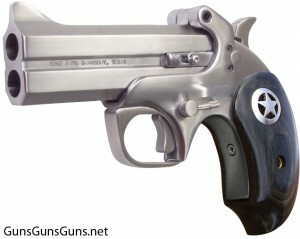 The Bond Arms Ranger II is a derringer that features blade-front and fixed rear sights, and black ash star grips. This latest version of the company’s Ranger pistol features a removable trigger guard. a stainless steel with satin polish finish. This entry was posted in .22 LR, .22 WMR, .32 H&R Magnum, .357 Magnum, .357 Max, .38 Special, .38 Special +P, .40 SW, .410, .44 Special, .44-40, .45 ACP, .45 GAP, .45 LC, $501-$750, 10mm, 9mm, Bond Arms, Over/Under, Subcompact on May 26, 2011 by Staff.